One of my best vacations!!!!!!!! Beautiful views out every window. Your very own private eagle and deer to watch. Very quiet, private, and relaxing atmosphere but close to town. With good restuarants and shopping. The picures don't do it justice. Brian was way helpful in finding things to do. From ATV rides on an island to boat rides out around the islands to view lava caves. Recommended for: Sightseeing, girls getaway, romantic getaway, families with young children, age 55+, adventure seekers, families with teenagers. 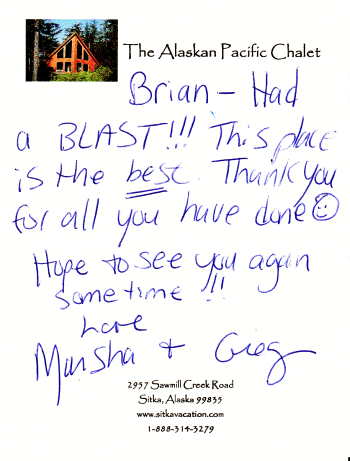 Our stay in Sitka was accentuated by the tremendous atmosphere we enjoyed in this beautiful chalet owned and managed by Brian Beall. 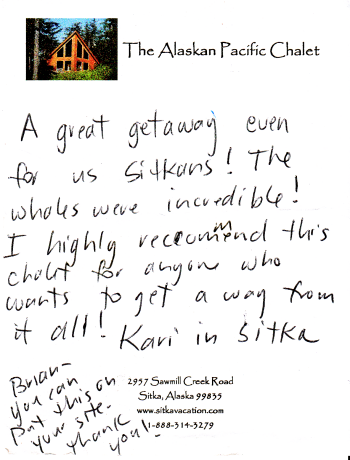 Brian will go out of his way to do whatever he can to make your stay in Sitka is memorable and easy going. He has tremendous knowledge of the Alaskan culture and is willing to take the time to share which helps to make your vacation an involved experience. The front room has two spectacular and different views of mountains and the bay in front of them. Whales and seals are easily seen from the lodge as well as an Eagles nest in the front yard. The fog may roll in and give a completely different look. All this and more can also be enjoyed while in a hot tub. 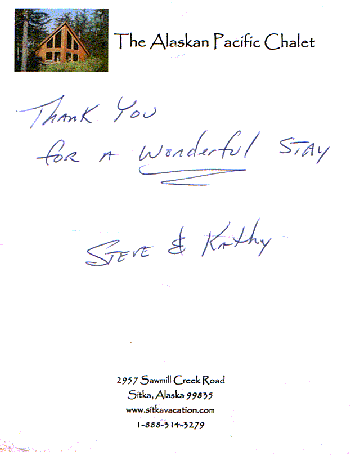 Best vacation rental in Sitka! Recommended for: Sightseeing, girls getaway, pet owners, people with disabilities, romantic getaway, families with young children, age 55+, adventure seekers, families with teenagers. Great stay with a large group! We had a large group as we brought several youth from Juneau to participate in the Julie Hughes Triathlon. 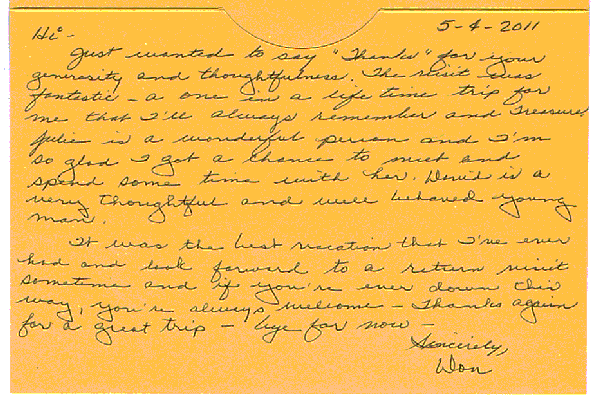 Brian was very accommodating and allowed us to have additional people in the house. We had some of the kids on the living room floor with sleeping bags, but there were certainly enough beds for all of the adults. The kitchen was excellent for making all of our meals and we loved the grill for a BBQ one night. There are two hot tubs, which were thoroughly enjoyed! There is great yard space for kids to play and roam. It is a much better alternative to a hotel or condo if you have kids. Would be wonderful for a group of adults as well. The views are spectacular. This lodge is also very close to the bear sanctuary. I have been to Sitka several times, but have never been to the sanctuary. It was very interesting and fun for the kids. If you've never been to Sitka, it is an amazingly beautiful place with lots of great hikes and great kayaking. Brian is exceptionally accommodating and is a wonderful host. 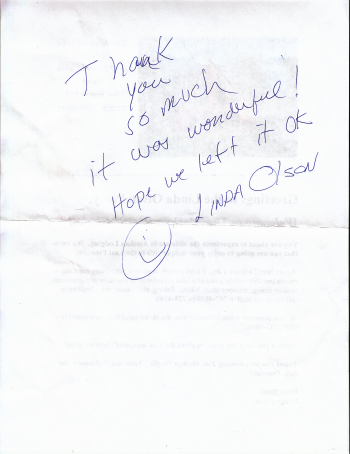 He was sure to check in with us to make sure we had everything we needed and was available to contact as needed. We were very comfortable and had an fabulous stay. Thank you!! I would highly recommend this lodge. Recommended for: Sightseeing, girls getaway, families with young children, age 55+, adventure seekers, families with teenagers. 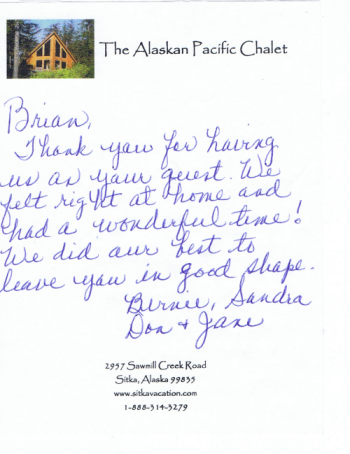 We were extremely pleased with the accomodations and the warm welcome by the owner. The vista was outstanding and it was especially keen when the bald eagle flew over us while seated in the hot tub. Recommended for: Romantic getaway, age 55+, families with teenagers. 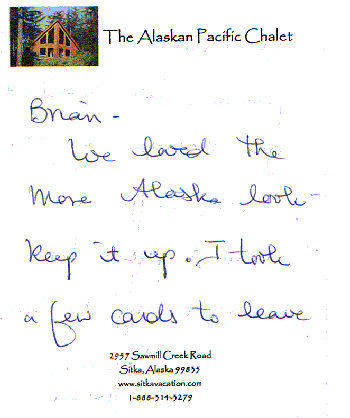 We had a wonderful vacation at the Golden Alaska Lodge. The views were incredible and the lodge itself was clean and well appointed. We were there for 10 days and had friends from California and our daughter, son in law and two grandkids there at different times. There was plenty of room for everyone, however for that many people two showers would be a great addition. 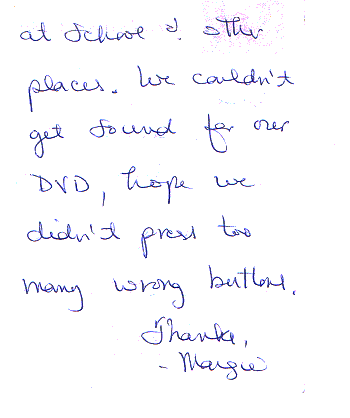 We had one small problem while we were there and the owner took care of it immediately with no disruption to our stay. Thanks Brian, hope to see you again in the future. Excellent Vacation Chalet!! The Golden Alaskan. Excellent vacation chalet! Loved every minute and appreciated all of the attention to detail (the huge beams, lovely millwork, books, kitchen supplies, laundry supplies, bathroom hair dryer, binoculars, cooking supplies, brochures left on the counters). It truly was a vacation trip of a lifetime!!! 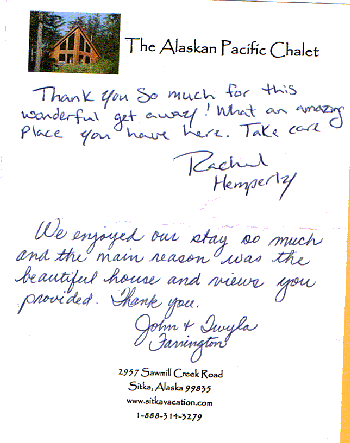 We would highly recommend this chalet to anyone who is looking to rent a vacation home in Sitka. Everything went smoothly and easily! 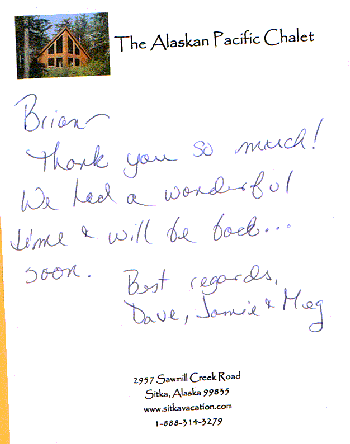 We enjoyed our stay very much at the Lodge. It was the PERFECT spot for our family gathering. Comfortable with wonderful views. We enjoyed watching the deer grazing on blueberry bushes in the side yard. Thanks! The Golden Alaskan Lodge. A Great Place to Stay!! Great place to stay. Lots of little extras that made our stay more interesting. Thank you so much! A View to Die For, Whales. Ocean, and Forest. An Ultimate Time! Subject: Girl's Party at Brian's Chalet! A group of about 10 women descended on Brian's place one cold, windy evening to celebrate our friend's birthday. What a cozy place!!! Brian even came in and started the wood stove for us. We enjoyed an awesome dinner, and a view out the window to die for!! Brian had lots of great music to entertain us with, along with a big hot tub that we all loved. The next morning as we sat down to another awesome meal, I commented that it would be the "ultimate time" if we were to see some whales. And as if on cue, 3 whales started jumping out of the water and slapping their tails! The backdrop to this was Bear Mountain covered in snow. Couldn't get much better. Can't Get Any Better. Whales, Woodstove, Hot Tubs. A group of about 10 women descended on the Golden Alaskan Lodge one cold, windy evening to celebrate our friend's birthday. What a cozy place!!! Brian even came in and started the wood stove for us. We enjoyed an awesome dinner, and a view of the ocean and Bear Mountain are to die for!! Brian had lots of great music to entertain us with, along with a big hot tub that we all loved. The next morning as we sat down to another awesome meal, I commented that it would be the "ultimate time" if we were to see some whales. And as if on cue, 3 Humpback Whales started jumping out of the water and slapping their tails! The backdrop to this was Bear Mountain covered in snow. Couldn't get much better. 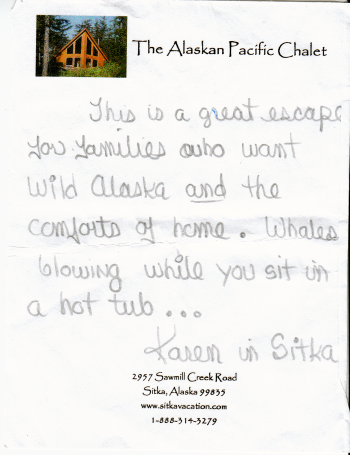 "The Sitka Girls"
A great getaway even for us Sitkans! The whales were incredible! I highly recommend this chalet for anyone who wants to get away from it all!